Shiver me timbers! 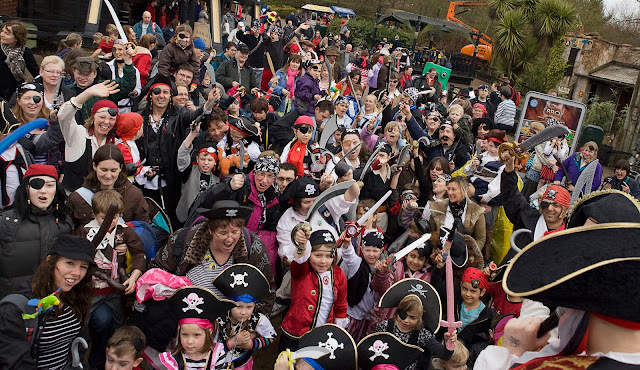 A Guinness World Record attempt took place 20th March 2010 at LEGOLAND Windsor for the “Largest Gathering of Pirates”. Hundreds of swashbucklers, buccaneers and seafaring pirates descended on the park for its opening day to officially launch the fantastic new land - Pirates Landing. The number one family attraction was a sea of pirates with kids, parents and grandparents wearing their finest pirate costumes. Record breakers were accompanied by fighting swords and talking parrots to “AAARRRR” their way into the famous record breaking books. Pirates Landing is a brand new attraction opening at LEGOLAND Windsor, marking the park's 15th season. Children can learn swashbuckling and seafaring skills at the Pirates Training Camp, then climb aboard the new Jolly Rocker swinging pirate ship - a huge unique LEGO Galleon - that swings to 18 metres high for the ride of their life. For more information about LEGOLAND Windsor go to www.legoland.co.uk/pirates or check out Legoland Windsor on ReallyKidFriendly.com to find out more about their excellent facilities for families with babies and young children. Legoland Windsor was rated 4.5 stars (out of 5) by mums and dads. Click here to find out why!